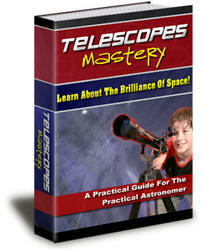 In its most general definition, exobiology is the study of the living universe. The term astrobiology is sometimes used for exobiology. Contemporary exobiologists are concerned with observing and exploring outer space to answer the following intriguing questions (among many others): Where did life come from? How did it evolve? Where is the evolution of life leading? Is the presence of life on Earth unique, or is it a common phenomenon that occurs whenever suitable stars evolve with companion planetary systems? Looking within this solar system, exobiologists inquire: Did life evolve on Mars? If so, is it now extinct, or does it still exist there—perhaps clinging to survival in some remote, subsurface location on the Red Planet? Does Europa, one of the intriguing ice-covered moons of Jupiter, now harbor life within its anticipated subsurface liquid-water ocean? What about the possibility of life in the subsurface liquid-water oceans now suspected to exist on Callisto and Ganymede—two other planet-sized icy moons of Jupiter? Exobiologists are also trying to understand the significance of the complex organic molecules that appear to be forming continuously in the nitrogen-rich atmosphere of Saturn's moon Titan. Beyond Earth, yet within this solar system, scientists are using a variety of sophisticated robot spacecraft to continue their search for life. With each sophisticated space mission during this century, scientists seek new evidence about the possible origin of life on Mars or Europa. Data from Titan, as well as from solar system small bodies such as comets and asteroids, are also providing valuable clues about conditions in the early solar system that promoted the development of life here on Earth—and possibly elsewhere. The more scientists learn about these diverse worlds, the more improved becomes their overall ability to search for other, possibly life-bearing, worlds around distant stars. Exobiology is more rigorously defined as the multidisciplinary field that involves the study of extraterrestrial environments for living organisms, the recognition of evidence of the possible existence of life in these environments, and the study of any extraterrestrial life-forms that may be encountered. As mentioned in chapter 2, biophysicists, biochemists, and exobiologists usually define a living organism as a physical system that exhibits the following general characteristics: It has structure (that is, it contains information), can replicate itself, and experiences few (random) changes in its information package, which supports a Darwinian evolution (i.e., survival of the fittest). Observational exobiology involves the detailed investigation of other interesting celestial bodies in this solar system, as well as the search for extrasolar planets and the study of the organic chemistry of interstellar molecular clouds. Exopaleontology involves the search for the fossils or biomarkers of extinct alien life-forms in returned soil and rock samples, unusual meteorites, or in-situ (on other worlds) by robot and/or human explorers. 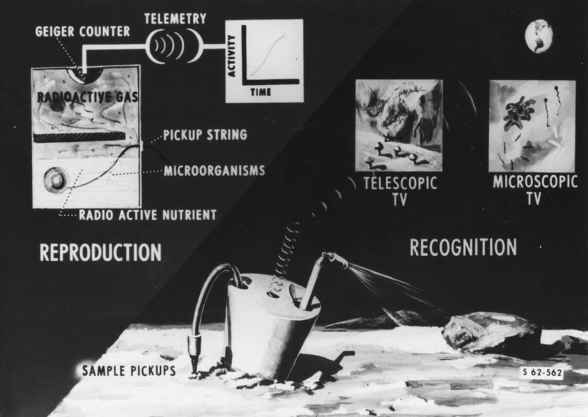 Experimental exobiology includes the evaluation of the viability of terrestrial microorganisms in space and the adaptation of living organisms to different (planetary) environments. The challenges of exobiology can be approached from several different directions. 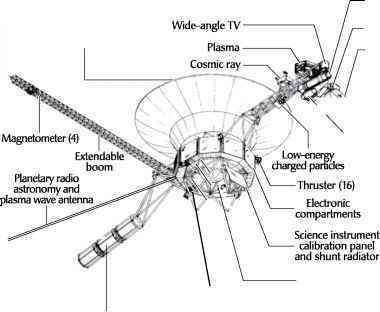 First, pristine material samples from interesting alien worlds in our solar system can be obtained for study on Earth—as was accomplished during the Apollo Project lunar expeditions (1969-72)—or such samples can be studied on the spot (in-situ) by robot explorers—as was accomplished by the robot Viking landers (1976). The returned lunar rock and soil samples have not revealed any traces of life, while the biological results of the in-situ field measurements conducted by NASA's Viking Project landers have remained tantalizingly unclear. However, because their results now strongly suggest that ancient Mars was once a much wetter world, the more recent robot spacecraft missions to the surface of the Red Planet have again raised the question of life there. A second major approach in exobiology involves conducting experiments in terrestrial laboratories or in laboratories in space that attempt either to simulate the primeval conditions that led to the formation of life on Earth and extrapolate these results to other planetary environments or to study the response of terrestrial organisms under environmental conditions that were found on alien worlds. remained isolated within the former Soviet Union and was not even translated into English until 1938.) A similar theory was also put forward in 1929 by John Burdon Haldane (1892-1964), a British biologist. Unfortunately, the chemical evolution of life hypothesis remained essentially dormant within the scientific community for another two decades. Then, in 1953, at the University of Chicago, American Noble laureate Harold C. Urey (1893-1981) and his former student Stanley L. Miller (1930- ) performed what many scientists consider as the first modern experiments in exobiology. While investigating the chemical origin of life, Urey and Miller demonstrated that organic molecules could indeed be produced by irradiating a mixture of inorganic molecules. 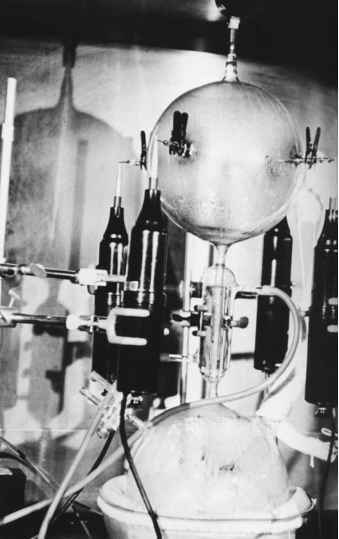 The historic Miller-Urey experiment simulated the Earth's assumed primitive atmosphere by using a gaseous mixture of methane (CH4), ammonia (NH3), water vapor (H2O), and hydrogen (H2) in a glass flask. A pool of water was kept gently boiling to promote circulation within the mixture, and an electrical discharge (simulating lightning) provided the energy needed to promote chemical reactions. Within days, the mixture changed colors, indicating that more complex, organic molecules had been synthesized out of this primordial "soup" of inorganic materials. Amino acid is an acid containing the amino (NH2) group, a group of molecules considered necessary for life. More than 80 amino acids are presently known, but only some 20 occur naturally in living organisms, where they serve as the building blocks of proteins. On Earth, many microorganisms and plants can synthesize amino acids from simple inorganic compounds. However, terrestrial animals (including human beings) must rely on their diet to provide adequate supplies of amino acids. Scientists have synthesized amino acids nonbiologically under conditions that simulate those that may have existed on the primitive Earth, followed by the synthesis of most of the biologically important molecules. Amino acids and other biologically significant organic substances have also been found to occur naturally in meteorites and are not considered to have been produced by living organisms.